It’s been a busy week at CeBIT here in Hannover, Germany, but luckily there’s been enough time outside of show hours to see a little of the city. 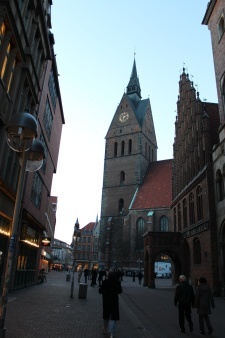 Just below is the Marktkirche (Market Church), which was built in the 1300s, and restored in the 1950s after being partially destroyed in World War II. Measured all the way to the top of the spire, the church is the size of a 30-story building — nearly 320 feet — meaning it’s still one of the tallest structures in the entire city. 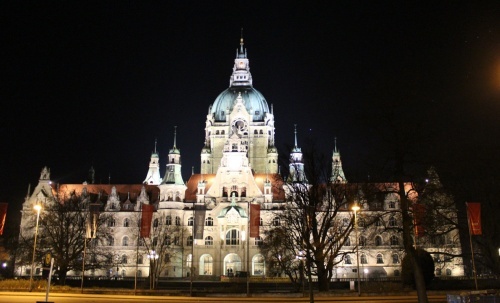 Below is a photo I took in front of the Rathaus, also called New Town Hall, which houses the city government. “New” must be a relative term, since it was built in 1913 — but since the old town hall was built in the 1400s, I suppose they’re allowed. A former business contact in the UK once teased me saying, “Our new buildings are older than your old ones,” and I have to admit he had a point. It’s always a fun study in contrast to come out of a technology show inside a huge modern exhibit hall, and be just minutes away from historic landmarks that are centuries old. Just another reason why this event is a pleasure to come to. Looking forward to one more day of CeBIT tomorrow!